Design: All Customize Shape Inlay Design. 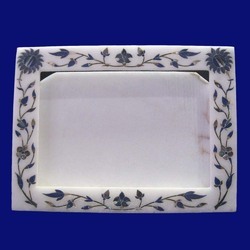 Stylish handmade picture frames with a elegant flower embossed decorations, on all the sides. Handmade Beaded photo frame for home decoration. - This is a beautiful picture / photo frame made from bangles. Painted Handmade Photo Frames are made of MDF & painted by hand. We provide these Picture Frames in various designs & sizes. We provide these Photo Frames keeping in mind the best quality. An appealingly rustic look distinguishes this photo frame from Sarai Tarin, Sambhal in India. The frame is handcrafted with reclaimed mango wood that is painted and given a distressed finish, and features a removable backing to insert a 4x6 vertical photograph. Size of this frame is 12"
-10", Made of Green Ablone laid on Indian hard wood frame and painted in white. Preserve those special moments splendidly into these intricately designed Photo Frames. These photo frames are intricately carved and will surely beautify the photos. Handmade Photoframe by RG Creations. We are engaged in offering an extensive series of Handmade Photo Frame. These products are made as per universal industry norms. 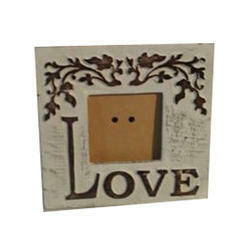 This three frame hanging Photo Frame is a great accessory for any room and any wall. Hanging frame made with handmade paper. Great for return gifts too. Makes #GreatGifts for all ages .